"The Project was terribly important. It gave us enough to live on and we could paint what we wanted. It was terrific largely because of its director, Burgoyne Diller. I had to resign after a year because I was an alien, but even in that short time, I changed my attitude toward being an artist. Instead of doing odd jobs and painting on the side, I painted and did odd jobs on the side. My life was the same, but I had a different view of it. I gave up the idea of first making a fortune and then painting in my old age." During its years of operation, the government-funded Federal Art Project (FAP) of the Works Progress Administration (WPA) hired hundreds of artists who collectively created more than 100,000 paintings and murals and over 18,000 sculptures to be found in municipal buildings, schools, and hospitals in all of the 48 states. Additionally, nearly 100 community art centers throughout the country provided art classes for children and developing artists. 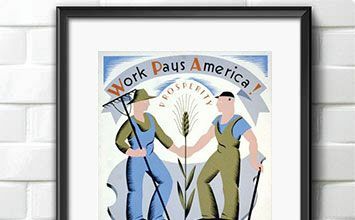 The FAP was part of President Franklin Roosevelt's New Deal during the Great Depression, in which he sought to put as many unemployed Americans back to work as possible and to buoy morale of the citizens. Some of the 20th century's greatest visual artists were employed by the FAP, including Thomas Hart Benton and Stuart Davis along with many nascent Abstract Expressionists. One of the main aims of the Federal Arts Project was to invoke familiar images that spoke of shared values and American progress, including technological wonders, fertile farmlands, small town life, and big city vibrancy. Additionally, the program hoped to foster the role of the arts in public life and to bring the artist closer to everyday, American life. The Federal Art Project tended to favor more realistic styles, including Social Realism and Regionalism, although many of the younger painters were able to execute more abstract work in some of the mural designs. The FAP allowed many artists for the first time to work exclusively as artists without taking up side jobs, and it brought the art they created in a variety of styles to communities and cities around the country through murals, easel paintings, photographs, posters, and sculptures. One of the most consequential aspects of the Project, according to the younger artists involved, with the sense of community that it fostered. By picking up their paychecks every week at the FAP office and getting to know each other as well as working on mural teams, artists no longer felt isolated and instead a camaraderie began to develop. Without this sense of community, it is hard to imagine the formation of Abstract Expressionism, one of the most significant groups in American modern art. In the mid 1930s, the United States remained at the center of a global economic depression. In an effort to provide economic relief to citizens who were having trouble finding work President Franklin Delano Roosevelt established the Works Progress Administration. Several months later, a subdivision of the WPA called the Federal Art Project was developed in order to assist struggling artists. First published on 19 Sep 2018. Updated and modified regularly.